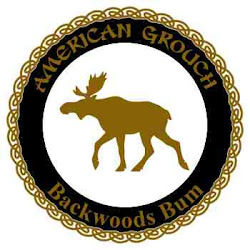 American Grouch: Perspectives, turnings, and rambling. I'm speaking from my own perspective here, my own point of view which will undoubtedly be contrary to some and that's okay. Funny thing about perspectives, everyone has their own and it is founded upon individual experiences and general knowledge base. A person's perspective often does not change unless it encounters something that shatters it with the hammer of reality. When a false perspective is easier to maintain, or that perspective being changed would result in extreme psychological distress individuals will often cling to it regardless of reality. Somewhere in here I think one could find the underlying reason for why the USA is the highest consumer of anti-depressant drugs, or indeed, drugs of all types. I digress. My own perspective was built through a fairly wide range of experiences, years spent in a steel mill living on overtime, building tires for a major US firm and being laid off three or four times a year, to starting my own company and burning the candle at both ends for years. Struggling to make ends meet to doing okay for myself now. Both professionally and self educated, experiencing both feast and famine, the peaks and valleys of life have led me along the way to where I am now. 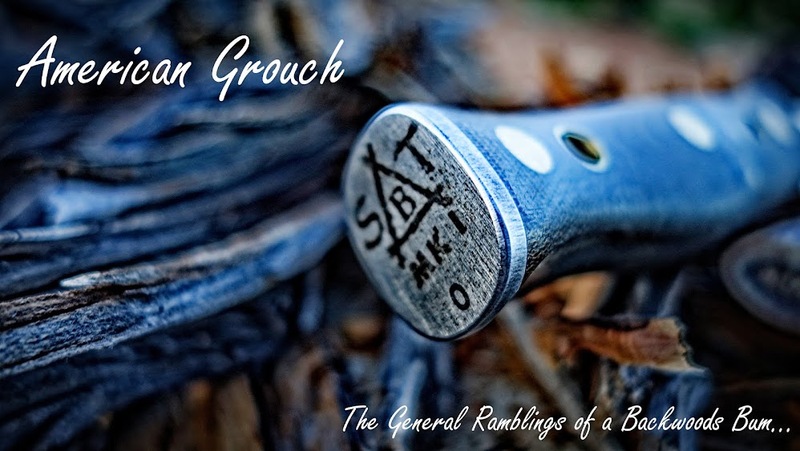 Before, and when I started this blog I was angry on many levels, with the economy, politics, where I was in life, hence the Grouch part as I was, and my wife will attest, a real Grouch. Where I lived then I had some access to the wild places but it was somewhat limited between geography as well as an extremely heavy work load. Not long after, I hit a different stride, I doubled down on the dream and moved to the wilderness, changed my working environment and proceeded down a simpler path in life. Almost immediately my perspective was changing. I had grown up outdoors, and you could say I went home and back to my youth. I found some peace and solace, I heard a voice I had not heard in many many years. And I listened to it. Now I still get some frustration, I still pop an angry spell from time to time but I am not angry all the time any more. This doesn't mean I am not aware, or that I put my head in the sand regarding our world and where it is on the misery index so to speak, no, I just found a different way to deal with it. The solid thunk of a splitting maul into a good chunk of wood is therapy in and of itself. I think humans have a tendency to 'search' for something, that there is a trait buried within our psyche that drives us for 'something'. I suppose that early on this might have been for nothing more than safety and survival, the next meal and shelter from a storm. Somewhere in here religion entered the mix and spirituality was born. Do not misconstrue this as I'm a believer in evolution and not in God, this isn't true and I'd rather not debate religion. Humans have something inside them that drives them to fill a void for lack of a better way of saying it. That void, over time, has been filled with many things. Survival, Spirituality, Conquest, Knowledge, traced over the spans of time and history you can find where man as a collective was in search of something. Somewhere along the way I believe this was recognized by others and then the effort to harness this process began. First through brute force, but this evolved over time as it was somewhat quickly recognized that killing people through raw conquest was a huge waste. Instead it was recognized that if you can get a person to willingly embrace something through their own volition that you then have a compliant, mailable, and submissive populace doing the bidding of those who understand how to pull the strings, or reins, of a collective society. How sensible is it to spend all the best part of one’s life earning money in order to enjoy a questionable liberty during the least valuable years? I would propose that civilization as we know it, by design, intends to shackle a people to a yoke, to pull a wagon filled not with the actual benefit to the people but rather the singular benefit of those with the reins. Who gave them the reigns? The people did, and willingly I might add. For the same reasons you put blinders on a plow horse, so too are they on the people, for if not blinded and fully exposed to the reality around them their perception would change, shattered by the hammer of reality. It's too late in the game now, to take another route without devastation and an even deeper mass misery of the people. We made a wrong turn a long time ago and we cannot back track, the question then becomes, how long before another turning, and when that turning happens, what are the consequences? I fully realize that what makes one person happy, may not make another happy even in the slightest, I get that. In the end we are all hitched to this wagon and pulling away, as the number of people pulling diminishes, the misery of those left at the yoke increases. Meanwhile those now not pulling live at the expense of others, all the while still miserable themselves to a more or lesser degree. What is the happy answer to all this? Maybe there isn't one under the current paradigm, for myself I would say that I have found some peace and happiness through simplifying my life as much as I can. We are all mortal and we are all here only for a short time, too short indeed to mull it up with complexities and contrivances that do more to damage our sanity and peace of mind than improve it. It is also my belief that as a society grows the individuals are more or less, cogs in a machine. As with all things mechanical, over time the process or the mechanism of its workings becomes more streamlined and efficient. As this happens some cogs in the machine are no longer needed. In fact as this process of streamlining occurs more and more cogs are removed from the machine as it still turns on and on relentlessly. Those cogs are tossed into the rubbish bin. Is this not how society and civilization are currently functioning? Are not the individuals who once powered the machine replaced with automated processes or other cheaper out sourced labor? I am not saying that one should not progress, either individually or as a society. I am saying our current paradigm produces waste of both resources and individuals, that the very design of it is harmful and destructive to the individual, to society, to the planet itself. Twenty years ago the pace of doing business was far less than that of today. Consider a moment, before the advent of email and cell phones, what occurred at the end of a business day. Unless there was some sort of emergency the day ended. Does it end now? For most that currently do business of any scale in our world there isn't an end time. Typically folks at this level are salaried, there is no clock to punch and as a result of our communications capabilities as they are currently, there isn't actually an end to the work day. I'm sure someone would argue that, yes, this is the case but those people are 'justly compensated' and if not they can work elsewhere. Well, if the 'elsewhere' work is exactly the same I believe the argument isn't valid. Further, what is 'just compensation' really? Is it how many chits are deposited into your account weekly? Pieces of paper through which you attempt to buy some semblance of happiness? If a value of a thing is determined by how much of your life you trade for it, and more and more of your life is required, there will come a time when the thing, whatever it may be, is simply too costly in terms of life/time spent on it. What happens at this point? The realization is made that one's life is owned by the machine itself and that there is not a practical means of escaping it for the average person. Slaves to the machine of our own making. To alter this course society would need to collectively embrace a simpler paradigm. Easier said that done to be sure. Ultimately this will happen, probably as a result of necessity as the current paradigm collapses around us all. During that collapse there will be pain, there will be suffering, as they say, change is never easy. As we go through this change which will inevitably happen, you can in fact make it easier on yourself. The simpler your life is the easier it will be. How do you make your life simpler? Become more self reliant, do more for yourself with less. What is essential to your well being? That should be a short and simple list, if you can answer to those items on that list, you're well on your way. A turning is coming, history is our map of the future, the direction of our society is going to change. To all things there is a cycle and a season, our civilization is not exempt from this rule. Well said Sir. Some deep thoughts to ponder. Thank you for a very thoughtful post. I just happened upon your blog (I'm also a fan of Whelen's). I've been thinking about making a change like you did, and it's inspiring to read what you're doing. Your weekly chocolate rations have been increased from 100 grams to 80 grams. Welcome to the real world. Great post...I think that you were reading my mind with some of your ramblings, good to know that I'm not alone. Right on as usual. I am much young and have a lot longer time to be a cog. I hope someday I can find the peace that you found. As a salaried IT guy I am unsure. The only other problem would be if we all simplified how long before forgin powers decide that we are ripe for the picking? Thank you for this post. I am trying to summon up the courage to live life differently. "What is essential to your well being?" The most profound questions are usually quite straightforward and simple. I want to put this question on a wall in my house somewhere, where I'm reminded to ponder it daily. I believe it was Thoreau who said, "Why should we waste the best years of our lives earning money in order to enjoy a questionable freedom during the least valuable part of it? It is a fool's life." Easy to say, hard to do. Particularly when you have a family to care and provide for. Your post offers great insight and advice. More people should adopt this view and approach to life. Valuable points, indeed.